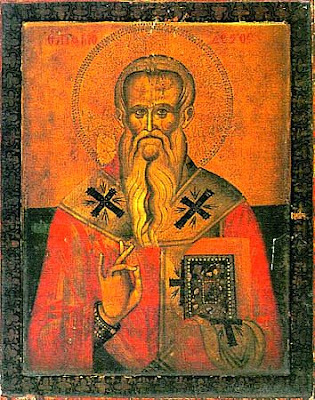 On the sixteenth of this month [December], we commemorate of our Holy Father Modestos the Archbishop of Jerusalem. As the tomb brought the Lord to earth. He was born of Orthodox parents, who were called Eusebius and Theodouli, in Sebastia in the year 298. Because his mother was barren, through the prayers of his parents a son was given to them, this great Father, after forty years of marriage. Having been born, his father was accused of being a Christian to Maximian. He was therefore put in chains and shut up in prison. When his wife Theodouli learned of this, she went to the prison with her son. Now in prison, they both beseeched God, and surrendered their souls into the hands of Holy Angels, becoming Martyrs in will and purpose. When the prison guard saw that his parents were dead, he found the child alive in their midst, so he took him and brought him before Maximian. The child was five months old at that time. When the emperor saw that the child was wholesome and graceful, he handed him over to a nobleman to raise him carefully, so that over time he may be found worthy to serve the false god Zeus. Thus the blessed Modestos was raised by this nobleman, and he learned how his blessed parents died in prison for Christ. When he arrived at thirteen years of age, he found a Christian, and from him he was taught piety, and became entirely familiar and given in to it. However, it grieved him that he had to associate with idolaters. One time, when Maximian proclaimed that all the people were to offer sacrifices to the gods, the Saint received permission to go to the grave of his parents, and he beseeched them to free him from the hands of the Greeks, in order to be made worthy of Holy Baptism. Wherefore he was found by a goldsmith, who was from Athens, and he took him to Athens, and entrusted him to the Bishop, who had him learn about the faith perfectly, to be baptized. When the Saint was baptized, a strange miracle followed. A pillar of fire appeared descending from the Heavens, which remained over the head of the one being baptized. Having been baptized, he healed by prayer alone and the laying on of his hands the brother of the goldsmith, who suffered from a terminal illness. He also healed a demoniac. Not long after, the goldsmith and his wife died, and together with their sons the Saint was written in their will, to also inherit their property. He however gave the portion of his inheritance to their sons, and withdrew to a most deserted place, where he lived in asceticism. However, the sons of the goldsmith, due to their ill-will were not able to see the Saint honored above them all, so what did they do? Because they were going to Misiri (Egypt) for a business matter, they urged the blessed Modestos to go with them. There they sold the Saint as a slave to an unbelieving man, by whom the thrice-blessed one suffered terribly for seven entire years. Nevertheless the Saint, by his fervent and unceasing prayers, liberated his master from the error of unbelief. And he persuaded him to believe and be baptized. He also suffered from a terrible illness, and the Saint made him well. After he died the Saint went to Jerusalem in order to venerate the life-giving Tomb. From Jerusalem he went to Sinai. There he lived in quietude and attached himself to God alone, and did many miracles. 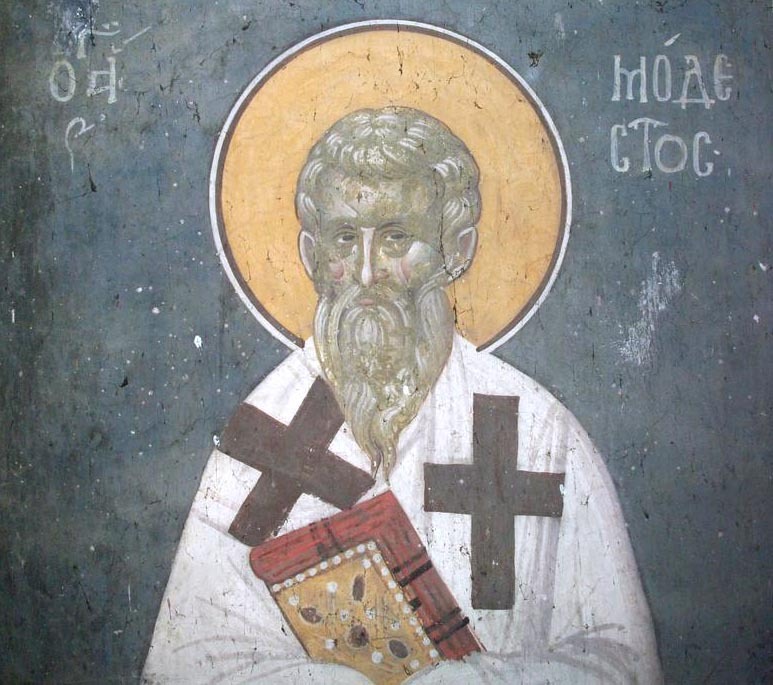 At that time the Patriarch of Jerusalem died, and for this reason after a divine revelation Saint Modestos was ordained Patriarch of Jerusalem, being at that time fifty-nine years of age. Even then the Saint performed many miracles, among which is the following. The animals of a certain man of Jerusalem died, for the spring of water they drank from was poisoned by a snake in cooperation with a demon. The Saint therefore went to this spring, and raised the animals from the dead. Meanwhile he also had the snake put to death, and caused the demon to appear before all those present, and made him swear in the most awesome name of God, to never approach that place again where the name of Saint Modestos was invoked. This Saint was altogether forgiving, showing this in the following occurrence. 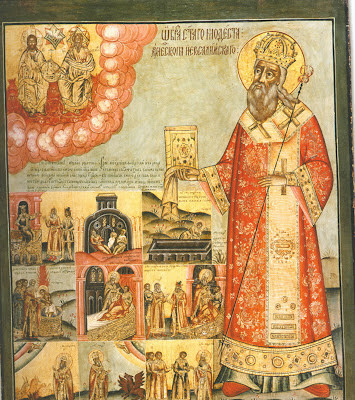 The sons of the goldsmith who sold the Saint in Misiri once went to Jerusalem, without knowing that the one they sold was now the Patriarch there. The forgiving Modestos, not only did not have them punished, in return for the wickedness they bestowed on him, but he embraced them and hosted them in a friendly manner, and was a benefactor to them in a magnificent way. 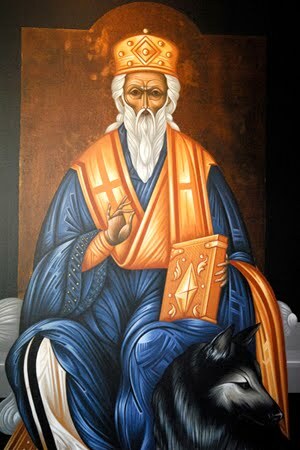 Thus this renowned man, having lived a venerable life, and living till he was ninety-seven years of age, and served as Patriarch for thirty-eight of those, departed for his eternal habitation. Thou didst gladden Zion with thy divine works. Enriched with apostolic illumination, thou didst serve thy Saviour venerably. Holy Father Modestos, entreat Christ our God to grant us His great mercy. Thou wast a venerable Hierarch, O Father, and didst serve Christ in Zion by thine angelic life. Therefore thou art glorified, O Modestos, adornment of Patriarchs. 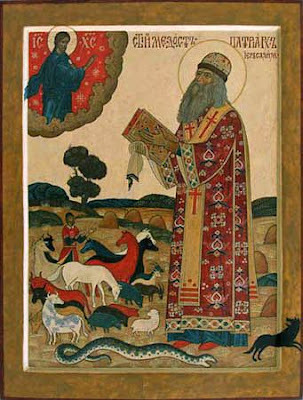 Rejoice, O radiant star of the Church, and divine protector of holy Zion; rejoice, O God-bearing hierarch Modestos, our most-fervent intercessor towards the Master. 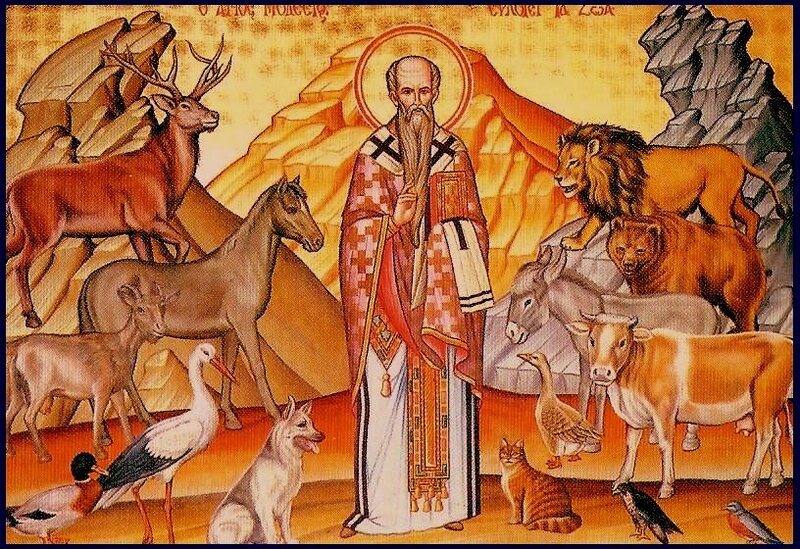 Prayer of Saint Modestos Bishop of Jerusalem, said in the case of every fatal sickness and danger to oxen, horses, donkeys, mules, sheep, goats, bees, and any other animals. O Lord Jesus Christ my God, Who are merciful and All-good, Who in wisdom created every visible and invisible creature, Who pours out His compassions upon all that He has created, Who through Your all-good Providence foresees and troubles over for all Your creatures: bodiless, physical, rational, irrational, soul-bearing, soulless, from the first to the last. For there is nothing that is not foreseen, neither is there anything abandoned by You, the Fashioner and Foreseer of all. For You are He Who opens His hand, and fills all living things with goodness. You are He makes grass to grow for the cattle, and green herb for the service of men. You are He Who once preserved from above the animal herd of Israel, from the fatal wound of the first-born animals of the Egyptians. You are He Who, through the compassion of Your incarnation, deposed he who had the might of death: that is, the devil, and by Your death, You put death to death. You are He Who, through myself Your unworthy servant, put to death the serpent, that corrupted the spring of water. Those that drank from it, both the living and the dead, through Your life-giving power, you resurrected. And the demon that was in cooperation with the serpent, as it prepared to make itself apparent, swore, that it would never dare to approach the place in which my humble name is invoked. To You, therefore, I pray, O All-good Master and Fashioner of all, and I entreat You, the Cause of all life, hearken to this my entreaty, and drive away every fatal sickness and danger from the oxen, horses, donkeys, mules, sheep, goats, bees, and any other animals in true need to the life of Your servants who call upon You, the Giver of every good, and upon my name. And grant, O Lord, to all those who celebrate my name, and with faith hasten to my relics, permanent peace, multiplication of animals, uncorrupted wheat, wine and oil, and above all, remission of sins, health of bodies, and eternal salvation of souls. Yes, O Lord Jesus Christ, for the descendants from Your very loins, grant compassion on the suffering animals, the herd of which is being afflicted by the sickle of death. And not having any word besides bellowing, and bitter and random noises, in Your mercy, take away their suffering and pain. For if You even call rational beings to this sympathy: "A righteous man has compassion upon his animals", as is written, how much more do You show compassion on these, Who are their Fashioner and Foreseer? For You, O compassionate one, preserved the animals in the Ark, as Your goodness and compassion won out. That by the wellness and multiplication of the oxen, and the remaining four-legged animals, the earth might be worked, and fruit might be harvested, and that bounteously Your servants who call upon my name will partake of their very harvest. And that through these, having all things that are necessary, might be increased in every good work, and glorify You, Who grants every good thing. And grant me also, Your servant and most-fervent entreater, the honor of Your all-governing Kingdom, for to You belong all glory, honor and worship, with Your beginningless Father, and Your All-Holy and good and life-giving Spirit, now and ever, and unto the ages of ages. Amen.